Fidel Castro addresses a special session of the Cuban Parliament on August 7, 2010. Havana, Cuba (CNN) -- In a rare interview, Fidel Castro gives new details about his health four years ago when emergency surgery forced him out of power, saying he didn't think he would make it and still has difficulty walking. "I was at death's door," he told the director of the left-wing Mexican newspaper La Jornada in an article published Monday. "I didn't aspire to live, much less anything else." "I asked myself many times if (doctors) were going to let me live in these conditions or let me die," he said. The 84-year-old did not, however, provide any details about what illnesses he suffered from. Cuban state TV read aloud a letter from Castro on July 31, 2006, announcing he was handing power to his younger brother Raul Castro. He disappeared from public view amid repeated rumors he had died. He later started writing essays for state media and appeared in occasional photos. Last month, Castro re-appeared in public to urge the United States to prevent what he sees as an imminent nuclear war with Iran. While he appears frequently on Cuban TV, he rarely grants interviews to the international media. Castro said at his lowest point his weight fell to 66 kilos (about 145 pounds) but that he was now weighing in at almost 86 kilos (about 190 pounds). "I want to tell you that you are looking at someone who has come back from the dead," he said in the interview. "This morning I succeeded in walking 600 steps alone, without a cane, without help." 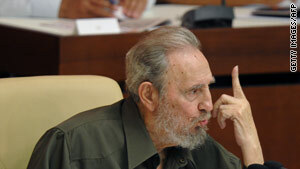 According to the article, Castro "devours" books and reads up to 300 news articles a day. When asked why all this activity, he replied: "I don't want to be absent in these days. The world is in its most interesting and dangerous phase of existence and I am committed to what is going to happen. I still have things to do." Castro said he wants to form an anti-war movement to deter a nuclear standoff. CNN's Shasta Darlington contributed to this report.